Provide your feedback via the survey! 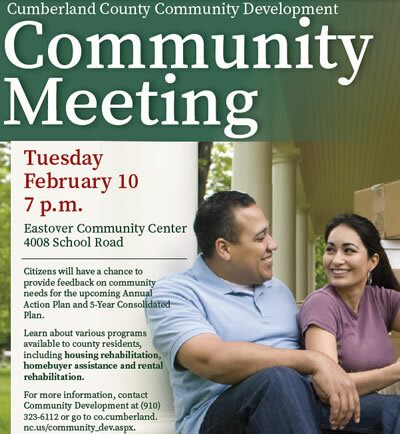 Representatives from Cumberland County Community Development will make a presentation to the Eastover Town Council, and provide surveys for public comment, at the regular monthly Town Council meeting on Tuesday, February 10, 2015. The meeting will be held at the Eastover Community Center, 4008 School Street, beginning at 7:00PM. Surveys may be returned that night, or mailed in later. To print a survey now, click this survey link, print a copy, and mail it in or bring it to the meeting.